It’s important, in such scenarios, to have a crystal clear idea of the basic requirements, and your costs before plunging into investments and trading. 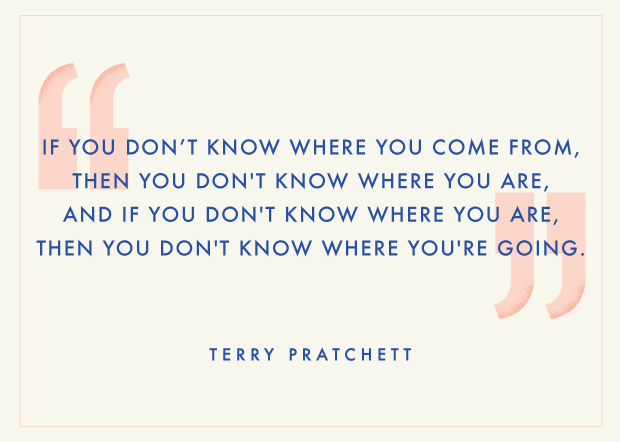 To paraphrase Terry Pratchett – if you don’t know where you come from, how will you know where you’re going? A demat account is where you store all your shares, stocks and other securities in an electronic, or dematerialized format. You don’t have to worry about storing and managing your papers, protecting them from theft or any kind of a disaster since everything is electronic. You can learn all about demat accounts. A trading account is essentially used to place buy and sell orders on the securities. While a demat account holds your assets, a trading account is a necessity to execute trades on these assets in the first place. Simply holding a demat account is not enough. Understand trading accounts better in our dedicated post. These charges are what your broker will levy to set-up your demat account. When the broker happens to be an existing banking institution, a demat account is usually free of cost. This is because the banking institute that offers broking services is doing it for a reason. The bank intends to generate more revenue by charging higher transaction fees, making this a fairly common business tactic. That’s why you should ideally check the demat account opening charges in light of all other bank-related fees before you begin. The custodian fee is charged by the brokerage firm for the safe-keeping of your securities in the demat account. This is generally charged yearly, based on the number of assets held onto by the firm. It may vary (Rs. 0.5-1) per ISIN (no. of securities) in a month. Similar to demat account charges, a trading account also has some costs associated with it. These charges are based on the number of transactions done through the account. These charges vary from one firm to another. Like a demat account, a trading account is usually free of cost when the firm is a banking institution, for reasons mentioned earlier in this article. This charge is primarily levied in advance on a yearly basis to keep your account working and ensure consistent service delivery. Many broker firms seek to simplify this process by clubbing it with demat account fees. Any brokerage firm usually charges based on the number of transactions – either based on value or on the number of stocks. As the numbers go up, so does the transaction fee. A brokerage fee would be payable by you which depends on the scheme and broker you chose. You’re likely to come across two different kinds of brokerage firms when you decide to start investing in the stock market – the traditional brokers and the discount brokers. 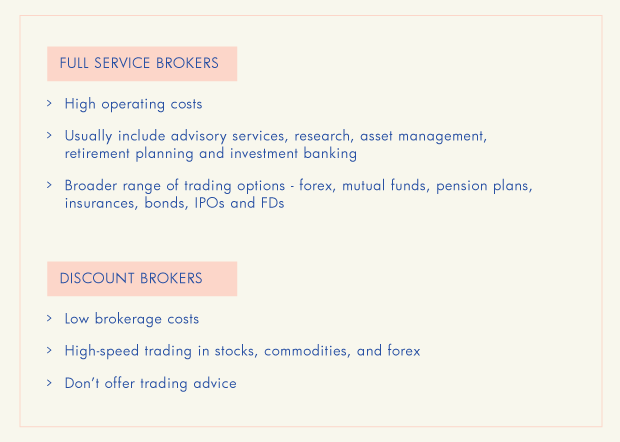 Full-service brokers, or traditional brokers, provide a bunch of add-on services apart from offering you the ability to trade on all sorts of securities (stocks, commodities, and currency). These usually include advisory services, research, asset management, retirement planning and investment banking. They also allow for a broader range of trading options – such as forex, mutual funds, pension plans, insurances, bonds, IPOs and FDs. Since you are getting personalized services, they come with a significantly high operating costs. This could eat up a decent chunk out of your profits in the long run. Discount brokers, also known as budget brokers – are rapidly gaining in popularity. While they offer significantly lower brokerage rates, high-speed trading in stocks, commodities, and forex. These brokers won’t offer you trading advice, so if you believe in your decisions and research, a discount broker is an obviously better choice. Budget brokers are ideal for a fast-paced trader who wants to place orders in a timely manner. Apart from being affordable budget brokers also offer strong and latest trading platforms that make your trading life easier. Clearly, a trading and a demat account are essential for everyone looking to trade and invest in securities. Now, with the new-age Aadhaar based registrations, opening a demat account is easier (and cheaper) than ever.